Sometimes, opportunities arise, and one seizes them, and achieves the intended result. 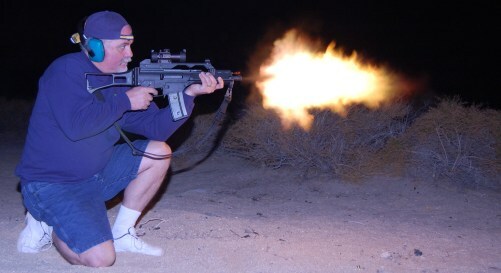 This is about one such time.Sam and I were invited to join what is a recurring trip to the desert to shoot guns. 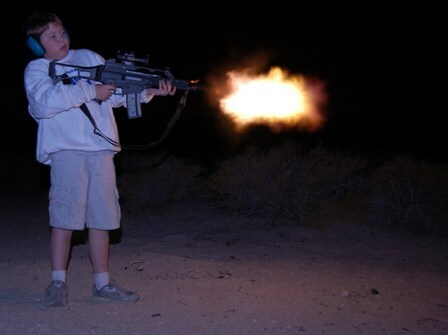 I have discharged one rifle, on one occasion, when I was 12 or so, probably without my parents’ prior permission. I was , I think, naturally concerned about taking a nearly 10 year-old boy to do this. Assured (with photos) that this was not the equivalent of giving him heroin and sending him into a life of crime, we agreed to go. It was only going to be one night, and it was a chance to see some friends that I hadn’t seen in a while. It was a chance to use our camping gear. To see the stars. All that stuff. And something else that I’ll get to in a bit. We arrived just before dusk, in a perfect desert setting for discharging firearms – spot to camp, and a nice bluff about a quarter-mile away to catch the bullets. Greetings all around, and a glimpse of the hardware awaiting us. I got the tent up, beds out, mattresses inflated, etc. We both got to pop off some rounds with a .22 rifle and an M-1. Sam was already somewhat familiar with the M-1 from some PC video games – it was a particular thrill to make the association. A clear evening, chili dogs, a campfire, it was a nice, relaxing time. Chad proved that, just as the instructions predict, Jiffy-Pop cannot be popped on a campfire. Brad burned some strips of Magnesium – white hot. You know, stupid stuff guys do in the middle of nowhere when there’s no Moms around. Mmkay? The photographers set up, and took pictures of us firing the big scary Semi-Automatic German rifle that went ”GerBoomen.” Soon, it was time to tuck in. Took a while to get to sleep with no electronics to lull us, but I’m told that I was snoring loud enough, soon enough. One of the realities of middle-aged ‘male-dom’ is the requirement, shall we say (in this venue), to answer the call of nature sometime between bedtime and the dawn. It is not customary for us city folk to be outside, out in the open, moonlight the only source of illumination. It was magical and monochromatic, the desert under a clear sky and half-moon. I turned my flashlight on and off, mostly for a momentary sense of security and control, but it seemed a sort of insult to the fact that I could see just fine without it. I stood under the stars for a little while, pondering things like those who spent months under these stars heading across this desert, a long time ago. I wanted to wake Sam up, but I realized that, by the time I got him fully awake enough to try and explain the concept, and gain some appreciation from him, he’d probably be more annoyed than inspired. Some serendipities are not so easily shared. Saturday was donuts and coffee (no one else drank coffee? ), and then taking turns shooting one of the oh, 15 or so guns that were offered – pistols, Deer rifles; Sam even shot the 12-gauge shotgun once. Your humble author managed to shoot a couple of clay pigeons, himself. I learned that there is a purpose for those AOL and Earthlink CD’s, after all. Our host is a police officer, a training officer, and a rangemaster. Most of the ammunition had been collected for disposal; we were actually performing a public service, too. I think we ran out of ammo at about the right time – I know that, although I’d had fun, had had enough of this kind of fun, by then. We picked up, said our thanks and goodbyes, and headed back over the mountains for home. I do so enjoy indoor plumbing. We’d unpacked, showered, and were pooped out in the Family Room watching TV, when Sam turned to me and said, “Well, I’ll never look at guns the same way, again.” That was the payoff I’d been hoping for, and I didn’t even have to ask for it. “How so?”, I asked. “They’re loud and they, they’re . . .” his voice trailed off. “Really destructive?” “Yeah.” There’d been a short discussion during the magnesium burning the night before, amidst the guy talk about how hot it had to be to burn, and how it’d burn through other metal and stuff - you know, the usual – including some remarks about how some military shells had magnesium in them so that, after they penetrated (no need to elaborate, is there? ), they’d keep burning. Sam and I talked, just for a little while, about both the cruelty and necessity for these weapons – this time particularly in the context of why a policeman carries and would ever discharge a weapon. This was my hidden agenda, and I was really pleased by the whole weekend – the way the guns were presented, the proper respect taught for these weapons and those who were responsible for them, and the subsequent damage and power they have demonstrated to my impressionable boy. I am grateful for the opportunity to have enabled these first impressions to be the right ones. I’m pretty confident that he won’t be someone who shoots up a school – of course, for reasons beyond just this – but it’s all part of it. He lives in a world that includes a lot of virtual, unreal representations of history, today, and the future. I really want him to be fully aware and engaged in the one he needs to be engaged in. I think this worked just the way I wanted it to. Things have changed. I am no longer spending 7 hours a day in a windowless room answering telephones, silencing alarms, and haunting online forums. I have been re-assigned into a division of my department called "Building Systems", as a "low-voltage" specialist. What this means is that I am doing many of the things that I was hired to do, and did, from 1986 to about 1991. In the last two weeks, I have installed content for a character generator (a PC that puts information into our Television distribution system, repaired some Nurse Call equipment, replaced a PA amplifier for overhead paging, and watched 2 contractors work. I am also learning (or re-learning, if you will) about the stuff in Building Systems that, while probably necessary, bore the living snot out of me. Things like taking meter readings (a rotating task that takes the average tech about 2-3 hours to accomplish, there are many meters spread all over the facility), testing the water for the boilers and adding the appropriate chemicals, and learning the intricacies of piping and valving and zzzzzzzz. I have an appreciation for these skills - every large building is a living, breathing, pulsing entity with it's own personality, and every good company has people like Mr. Scott or Geordy LaForge of Star Trek to love/hate/cajole it into peak performance. Scotty I kinna be. I do like troubleshooting, and have enjoyed getting my mind and hands into some simple repairs. The new tools are nice, too. I refuse to accept, however, that this is where I'm supposed to be. Sorry. I'm having to re-arrange my online existence, though, which is probably a good thing, but a bit consternating. It is nice not to have to get to work, and within 15 minutes feel the pressure when the Operator wants to take a break and leave me with the hospital phones first thing in the morning. Now it's the morning meeting, the meeting after the meeting, stroll down to the shop, open the toolbox, check the email, and start working on the next thing. The old workdays I remember. I'm going to have to start carrying a notepad though, because I can't just pop up the blogger and riff off a rant. I've had some good (at least I think ) ideas come up only to fade when I try to recall them, later, lately. I can now go to the bathroom without finding someone to relieve me whilst I relieve myself. The Building Operations Center was all about pressure, to me, and not just on my bladder. Not the kind that excites one into pro-active action or problem resolution. The one where procedures are written, and then interpreted and re-interpreted like The Book Of Revelation to a point where, when something serious occurs, functionaries like myself could have done better. No matter how well we did it. Having to know who's asking, as well as what they want. I don't miss it, but I do miss the time to write. - Bob Dylan, "Things Have Changed"